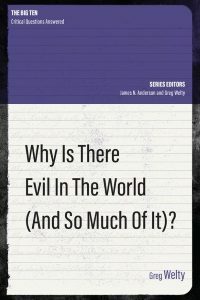 Could you recommend the best books for me to read on a Reformed perspective on the problem of evil? John Calvin, Institutes of the Christian Religion, I, chapters 16-18. D. A. Carson, How Long, O Lord? (Baker, 2006). John M. Frame, The Doctrine of God (P&R, 2002), chapter 9. Paul Helm, The Providence of God (IVP, 1994), chapters 7 & 8. James S. Spiegel, The Benefits of Providence (Crossway, 2005), chapter 6. Suffering and the Sovereignty of God, edited by John Piper and Justin Taylor (Crossway, 2006) is very good for a more pastoral perspective. I’ve heard good things about John Feinberg’s The Many Faces of Evil, but it’s still on my to-read list, so I can’t give a personal recommendation. 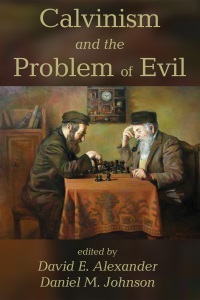 Also look out for a forthcoming multi-author volume, Calvinism and the Problem of Evil, edited by David E. Alexander and Daniel M. Johnson (Wipf and Stock). I don’t know exactly when it will be published. I think James’ note is too quick. For what sort of ontological containment is at play here? Clearly many sorts of containment, such that A contains B, don’t support the inference that P(A) if P(B) for just any property P. Consider mereological containment, where A contains B just if B is a part (or perhaps proper part) of A. A very large clock tower — Big Ben, say — has many proper parts less than 1′ tall. But it doesn’t begin to follow that the same goes for Big Ben; it doesn’t follow that Big Ben, too, is less than 1′ tall. Much the same goes for spatial containment, which James’ himself seems to dismiss as a relevent sort of ontological containment. My carton of non-fat milk and the refrigerator in which it’s contained have, among other things, very different dimensions and construction. Further, the milk can have soured and yet it still be false that the same goes for the refrigerator. Perhaps, then, the relevant notion of ontological containment is that displayed by sets and their members. But this, too, won’t do, for of course while 7 is prime, then same can’t properly be said of (e.g.) the set of natural numbers of which 7 is a member. Of course there’s much more to be said here. No doubt there are other notions of ontological containment which will support the general inference above, as well as (otherwise) faithfully capturing what the panentheist means to assert. Or perhaps we need to look more closely into relevant types of property; perhaps there are properties of some type, such that any property of that type does apply to the container if they apply to the contained item. Michael Sudduth, a philosopher of religion at San Francisco State University, has caused quite a stir by announcing his departure from orthodox Christianity and conversion to Gaudiya Vaishnavism (a form of Vaishnava Vedanta Hinduism). Having known Michael for over a decade, and having had many profitable philosophical discussions with him, I was extremely grieved to read this announcement, although it didn’t come completely out of the blue. Some mutual friends had informed me of his increasing interest in Eastern religion and his gradually distancing himself from biblical Christianity. We had an email exchange last year when I raised some concerns (my last email, it turns out, was sent several days before his “profoundly moving religious experience of Krishna”) but it quickly fizzled out because Michael wasn’t ready at that time to set out his views in detail. Consequently, I now accept a panentheistic metaphysics in which the universe and human souls are, to put it roughly, in the being of God.